Kevin Nash and Jimmy Hart star in Jesse T. Cook's delightfully nutty wrestling horror. Momentum UK R0 DVD. To quote a British advertising slogan, Monster Brawl does exactly what is says on the tin - it promises 90 minutes of monster wrestling action and it delivers. While many classic monster films promised a show down between two or more iconic creatures (cf. Frankenstein Meets the Wolfman (1941)) they usually only delivered the titular promise in the final few minutes after a lengthy build-up and tenuous storyline contrivances. 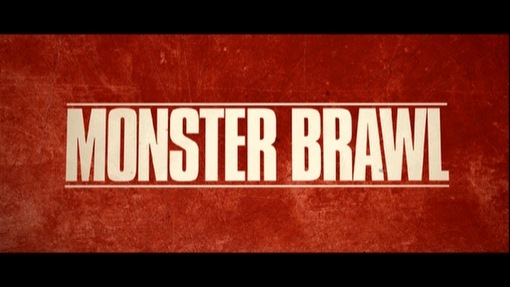 Writer and director of Monster Brawl Jesse T. Cook instead provides a true showdown between the monsters in a film that from start to finish is designed to resemble a classic televised pro-wrestling show. Accordingly there is no storyline to speak of - short background sections to each of the monsters before their bouts is the only time the film breaks away from its wrestling show format, complete with commentators, ring announcer and trash talking pre-match promos. The commentators play the key role and are well scripted, keeping the film moving and proving amusing interaction - although it is to the film's advantage that despite a dark vein of humour running throughout the script, the temptation to resort to silly comedy and self-parody is avoided. The monsters themselves are well chosen to provide good variation and with of course many of the most famous movie monsters being unavailable because of copyright restrictions, the only real disappointment is the lack of reference to the classic El Santo Mexican wrestling horror films. Pacing throughout is relatively slow but consistent and the film moves along well to a suitably dramatic climax, never outstaying its welcome at just over 80 minutes. Behind the camera, Cook and the production team do a stellar job, making this micro-budgeted production look fantastic. The main graveyard set looks superb as do the costumes and the frequent gory effects are particularly well done. The soundtrack is a little generic but provides a decent background - it is only a pity that the fighters are not accompanied by their own entrance music. From the world of professional wrestling, 'Mouth of the South' Jimmy Hart plays himself as the typically over-the-top ring announcer, while UFC official Herb Dean has a short role as the match referee. One of the iconic wrestlers of the 1990s/2000s Kevin Nash has recently started moving into acting and he is well cast here as the colonel who created Zombie Man, getting a good dose of screentime. Dave Foley and Art Hindle (The Octagon (1980)) play the commentators and really get into the spirit of the film, while the rest of the parts are played by a mix of local pro-wrestlers and the crew, all of whom give strong performances. Lance Henriksen (Aliens (1986)), credited as God, provides a wry voice-over narration. Monster Brawl is a wonderfully unique little film - eruditely combining cheesy '90s wrestling with cheesy monster movie creatures. Obviously this will not appeal to viewers wanting a straight horror film, but fans of horror films and wrestling will love it and thanks to the gory highlights and dark comedy it would make a superb party film, just crying out for a beer and nacho accompaniment. Any gore or violence ? Several very gory effects. Who is it for? Fans of cheesy monster horrors and pro-wrestling will love this. A strong transfer that always looks good even though mostly at night. Audio English 5.1 surround - sounds strong. The DVD case includes oversize top-trumps cards for the wrestlers. Other regions? Available in the US Image on DVD and Blu-ray. A highly enjoyable little film that delivers exactly what it promises. A strong DVD release and the behind-the-scenes documentary is well worth watching.